Summertime 1968. I was 12 years old. The Detroit Tigers were playing baseball the way it was meant to be played, going 103-59. Denny McClain goes 31-6 with a 1.96 ERA. Al Kaline, Willie Horton, Bill Freehan. Norm Cash. Jim Northrup. Oh, my! The Tigers face the St. Louis Cardinals in the World series that goes seven games. Detroit’s #2 starter, Mickey Lolich allows just five World Series runs in three complete games, winning all three, including the final game…and also helps himself in game two hitting his only home run of his 16 year career. Are you kidding me??? Baseball. Running through the sprinkler. Splashing in a pool somewhere. No school. Hanging out with friends. Summertime. It is magic! Summer 1968, I shot my basketball thousands of times against a backboard mounted on the garage in my backyard, while every radio in the neighborhood boomed the Detroit Tigers games for all to hear. Wait! What’s that??!! Did Willie Horton just hit it out of the ballpark again??!!! You bet he did! And Al Kaline, racing back to the warning track in right field…you know he made that catch! Oh, man! Tigers win!!! Summertime is full of magic and wonder if you know where to look, and with a little planning. Maybe it’s not at the ballpark. Maybe it’s at the beach or the mountains or the big city. And maybe…just maybe…it’s in a perfectly grilled burger. 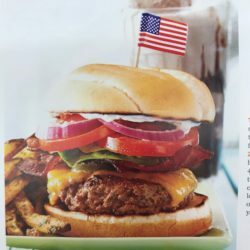 There used to be a recipe on the side of the box of Lipton Onion Soup..mix that into your hamburger and then make patties to grill. Oh, yes! Maybe it’s still on that box. Now grilling a burger is a little tricky. Too long on the grill, or press down too hard with the spatula, and the juices don’t stay in the burger and the burger is burnt. But when you know what you’re doing… Now add the cheese…oh, you have to add cheese! There you go! You just grilled up some summertime magic, and it is spectacular! Need a little help? 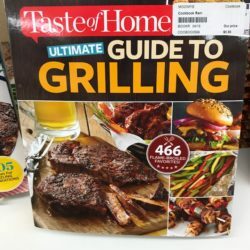 Come see us for the “Taste of Home Ultimate Guide to Grilling.” Just $5.99 until they’re gone! The recipes are a-ma-zing! Summer never tasted so good. At the MoonPie General Store, we want to be a part of helping you make that summertime magic for your family. And we know a lot of ways to make that happen, believe me! And for some of us…summertime is all the better if the neighborhood radios are blasting a Detroit Tiger Baseball game!